This epic new Lego Kingdoms set was just announced. Coming in January 2012, it will cost $119.99 and include 1,575 pieces. So many great elements to the set. Also, if you look closely, you’ll notice that the black knight is not a Kingdoms dragon knight, but a update to the classic Black Falcon knight. The gallery and press release are below. Watch the Knights battle it out at the Royal Joust! It’s the most exciting event on the LEGO Kingdoms calendar! Join the King and Queen at the Royal Joust as the knights on horseback battle it out for the hand of the beautiful Princess. 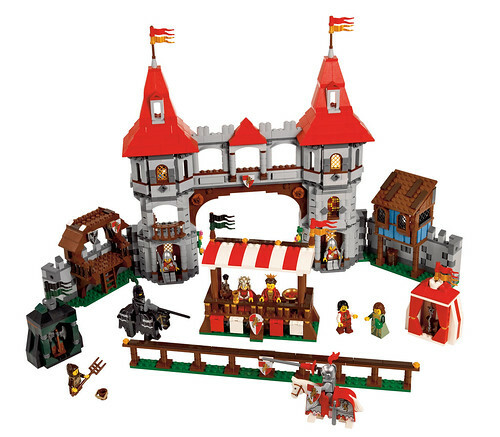 This detailed set recreates all the majesty of a medieval pageant, from the large, 6-roomed castle with linked wall extensions, 2 knights’ weapons tents, royal viewing box, jousting fence and of course 2 magnificent jousting horses. Combine 2 Kingdoms Joust sets for a scene that is truly fit for a King! Includes 9 minifigures: king, queen, princess, lion knight, falcon knight, young squire, nobleman and 2 soldiers. • Includes 9 minifigures: king, queen, princess,, lion knight, falcon knight, young squire, nobleman and 2 soldiers! • Knight minifigures include armor decoration, helmet, jousting pole, shield and 2 extra weapons! • Features castle with 6 detailed rooms with lots of accessorie and 2 knight’s tents with weapon holders! • Open back for easy access to linked wall extensions! • Also features royal viewing box with flags and coat of arms! • Includes 2 knight’s horses with detailed decoration, weapon holder and armored headgear! • Explore the castle rooms! • Battle it out for the hand of the princess! • Combine 2 Kingdoms Joust sets for a scene fit for King! • Castle measures 20″ (51 cm) wide and 12″ (30 cm) tall! Via FBTB and the Brothers Brick.